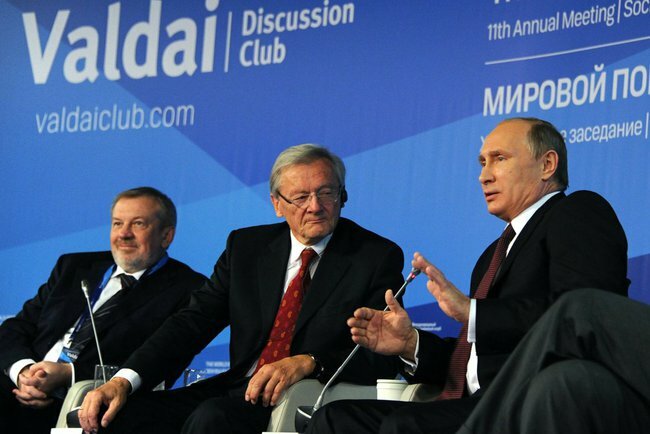 Putin spoke October 24 at the annual meeting of the Valdai Club, where foreign policy experts from around the world gather to talk about Russia. Although its major themes were previewed by Foreign Minister Sergey Lavrov a few days before, the Russian website slon.ru said that the speech "could confidently be placed in the same rank as the 2007 Munich speech" (his first substantial criticism of the U.S. and the unipolar world it led) and was "the most anti-American speech Putin has given since coming to office 14 years ago." They [the U.S.] once sponsored Islamic extremist movements to fight the Soviet Union. Those groups got their battle experience in Afghanistan and later gave birth to the Taliban and Al-Qaeda. The West if not supported, at least closed its eyes, and, I would say, gave information, political and financial support to international terrorists’ invasion of Russia (we have not forgotten this) and the Central Asian region’s countries. Only after horrific terrorist attacks were committed on US soil itself did the United States wake up to the common threat of terrorism. Let me remind you that we were the first country to support the American people back then, the first to react as friends and partners to the terrible tragedy of September 11. As for Russia itself, there are conspiracy theories that the U.S. sponsors Chechen terrorists, and somewhat more plausible reports that Georgia, under the Mikheil Saakashvili government, trained and hosted Chechen rebels. But far more significant was the fact that in the early post-9/11 period the U.S. actually helped Russia fight Chechen rebels by training and equipping Georgian troops to fight Chechens in Georgia's Pankisi Gorge. Most of Putin's grievances against the U.S. have been things which one may interpret in various ways, but which nevertheless no one doubts happened: the expansion of NATO, establishment of missile defense on Russia's borders, U.S. efforts to promote its values and political system in Russia. Lately Russian anti-U.S. rhetoric has increasingly focused on the U.S.'s contrivance of "color revolutions" (for example in Georgia, Ukraine, and Kyrgyzstan), which is a bit tougher of a case to make: while the U.S. certainly encouraged and supported these revolutions, Washington's role was relatively minor compared to the internal drivers of the revolutions. And now, this claim that the U.S. sponsored terrorist invasions of Russia and Central Asia. It's just one speech, and who knows if he got carried away rhetorically and went further than he intended to. But it could mark another step in the escalation of his rhetoric, and raises the question: does he really believe this?